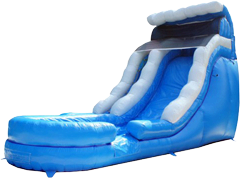 The 18 foot Wave Runner Slide is a single lane extremely steep slide. It is great for all ages. When used wet, the water runs down into a pool at the bottom.